It’s quite funny following Matilda from the first day she was born. You could tell by looking at her little eyes that she is special. Her uniqueness soon comes out when at the age of four she demands from her parents Harry and Zinnia (Danny DeVito and Rhea Perlman) to buy her a book. As you can imagine, they have acknowledged Matilda’s sense of humor and the only answer they give is – indifferent laughter. Since her parents leave the house for the rest of the day, the girl decides to go to the library where in no time she learns more than any adult would learn in one lifetime. As the story unfolds, Harry and Zinnia get annoyed by smartness of Matilda and decide to punish her. But the reason Harry gives Matilda for being punished gives an idea to Matilda in her future plan to teach her parents a lesson. Annoyed by Matilda’s smartness and wiseness, Harry makes a deal with one of his client, Agatha Trunchbull, the oppressive principal of Crunchem Hall Elementary School where kids feel themselves like they’re in prison. But from the first day Matilda gets challenged by evil Trunchbull, but since she has her telekinesis gift and is super smart, Matilda becomes the favorite not only for children, but her teacher as well who has a sweet last name, Miss Honey. 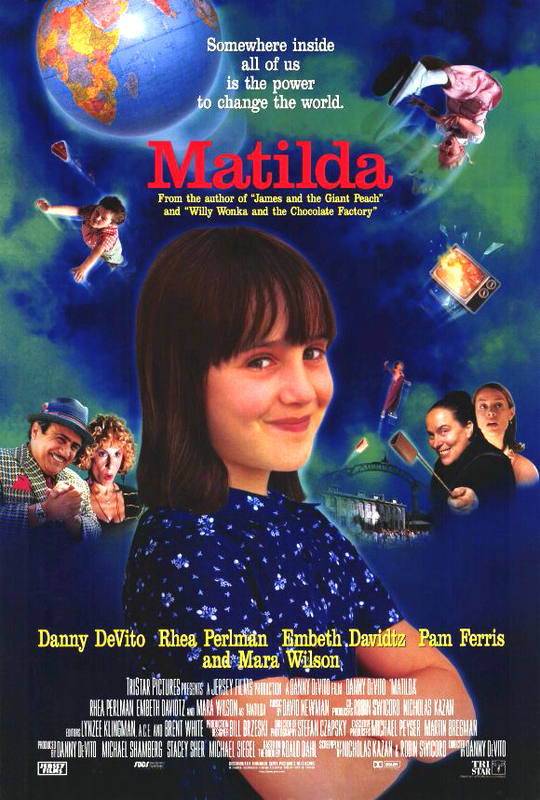 Matilda directed by Danny DeVito, who portrays a crooked man Harry, Matilda’s father. It’s amusing to see how after so many years the film despite getting older does not lose its charm. Right from the beginning, if you already know what this movie is up to, it does a little to overload you, if at all. It creates a super funny environment, some hilarious scenes, and Mrs. Trunchbull, who you would never get tired of watching. Despite being an evil character, thanks to the brilliant performance of Pam Ferris who steals every scene she appears in, her commitment to the art is admiring as she turns herself into an ugly creature who terrorizes children. In conclusion, Matilda is a movie you can watch any time and any day of the year. It’s a ridiculously funny movie you would feel happy to watch with the entire family. It’s simple, cute and absolutely adorable film that will be and is loved, most likely, by any family who ever got a chance to see it before. So if you feel by any chance, upset, sad or broken and looking for some positivity, Matilda should be your first and the only choice to bring your mood back on track.